April 13: Kieran McGovern scored 55 seconds into overtime to lift the 17th-ranked Union Dutchmen to a 12-11 win over the No. 18 St. Lawrence University men's lacrosse team in Liberty League action on Saturday at North Country Field. Senior Conor Caffrey scored three goals and added two assists to lead the Saints with five points and surpass 100 career point mark for the Scarlet and Brown. Junior Mike Donnelly also scored three goals and picked up two ground balls, while Jack Hennessey scored two goals and assisted on two others. Ben Murtagh, Harrison Koch and Guthrie Little each scored once for the Saints. Owen Manley and Tyler Burns each caused three turnovers, while Saints' goalkeeper Alex Terry and Zachary Prime each grabbed five ground balls. Union opened scoring with a man-up goal from Keaton McCann, but was matched with a goal from junior Mike Donnelly to tie the game 1-1 after the first 15 minutes of play. The Dutchmen scored three unanswered goals to build a 4-1 lead with 7:28 remaining in the second. Mark Mahoney fed Jack Hennessey to close the gap to two, but the Dutchmen struck twice more to take a 6-2 lead. Caffrey notched back-to-back goals, closing the gap back to two before halftime. The Saints fired off four straight goals after the break to take a 8-6, but three unanswered tallies from the Dutchmen put Union back up 9-8. Hennessey fed Donnelly to give the Saints an 11-10 edge with 3:56 to play, but Keaton McCann knotted the game at 11 with 2:30 to play. McGovern ended the game at 3:05 of overtime. Hayden Frey led the Dutchmen with three goals and an assist, while McCann and McGovern each scored three goals. Michael Sands tallied two goals, while Kerry Lyne added one. Alex Newhouse went 13-for-20 at the faceoff dot and grabbed a team-high seven ground balls, while three different members of the Union squad each caused one turnover. 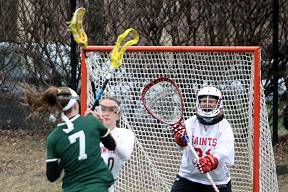 Terry made eight saves for the Saints, while Jack Santilli finished with 11 saves for Union. Union outshot the Saints 40-36, but the Saints edged the Dutchmen 22-20 in shots on goal. Union converted on 2-for-5 man-up opportunities, while the Saints went 2-for-4. St. Lawrence fell to 10-2 overall and 3-2 in conference play, while Union improved to 10-1 and 4-0. After today's game, the Saints honored the class of 2019 – Nick Brindisi, Zach Ettinghausen, Owen Manley, Conor Caffrey, Jordan Eichholz, Alec Georgiadis and David Jennings. April 10: Junior Mike Donnelly scored four goals to lead the 18th-ranked St. Lawrence University men's lacrosse team to an 11-10 win over Route-11 rival Clarkson in Liberty League action under the lights at North Country Field on Wednesday night. Zachary Prime, a USILA Team of the Week selction, once again dominated at the faceoff dot for the Saints, going 15-for-23. Prime also scored one goal and grabbed a career-high 12 ground balls. Jack Hennessey notched a goal and two assists, while Conor Caffrey and David Jennings each recorded one goal and one assist. Harrison Koch, Patrick Abad and Garret Glasgow also scored for the Saints, with Abad's goal marking the first of his career for the Scarlet and Brown. Owen Manley caused three turnovers and grabbed two ground balls, while Brian Gannon recorded two ground balls and two caused turnovers. Clarkson struck first and built a quick 2-1 lead over the Saints with 6:58 to play in the first quarter. Glasgow recorded his third goal of the season to force a 2-2 tie after 15 minutes of play. Prime scored off the opening faceoff and Donnelly added his 28th of the year, putting the Saints up 4-2, but the Golden Knights rattled off three goals and Zachary Ettinghausen found Caffrey for a third for the Saints, leading to a 5-5 tie at halftime. The Scarlet and Brown outscored the Golden Knights 5-1 in third, including a man-up goal from Harrison Koch and a man-down goal from Donnelly, to take a 10-6 lead heading into the final frame. Jennings put the Saints up 11-6 with an unassisted tally, but Clarkson forged ahead, scoring four unanswered goals to bring the game within one. Saints' goalkeeper Alex Terry shut down Marcus Lavarnway with 13 seconds to play and the Golden Knight's nearly scored on a last second opportunity, but the Saints held on to record their eighth consecutive victory over Clarkson. Billy Bergan led the Golden Knights with three goals, while Conor Bartlett and Pierce Currie each scored twice. Evan Burgett tallied a goal and an assist, while Bryan Penney and Max Hoffer also scored for Clarkson. Liam St. Croix picked up a team-best five ground balls, while five different members of the Golden Knights' squad each caused one turnover. Terry, who tops the Division III rankings in goals against average, made nine saves for the Saints. Terry's save with 13 seconds left allowed the Saints to hold their one-goal edge over Clarkson. Kevin Dyckman made six saves for the Golden Knights. St. Lawrence outshot Clarkson 37-27, but the Golden Knights managed a 19-17 advantage in shots on goal. The Saints held a 26-22 advantage in ground balls, while the Golden Knights went 2-for-6 on man-up opportunities and the Saints went 1-for-2. St. Lawrence improved to 10-1 on the season and 3-1 in conference play, while Clarkson fell to 7-5 and 2-3. April 10: A five-goal third period allowed St. Lawrence to weather a late charge by the Clarkson University Men's Lacrosse team, but the Golden Knights came up just short in taking down the Saints, falling 11-10 in Liberty League action Wednesday night. The Golden Knights fell to 7-5 overall and 2-3 in the Liberty League, while the Saints moved to 10-1 and 3-1. Clarkson looks to get back on track this weekend when the program celebrates its seniors with a game against Vassar College on Saturday. The two teams tussled back and forth in the first half, as momentum shifted from one to another, only to see the game tied at 5-5 at the half. The second quarter saw an early flurry of scoring, with five goals tallied in just over three minutes, but Max Hoffer picked up an unassisted goal at the 5:33 mark of the second to tie the game at 5-5. In the third quarter, the Saints took a two-goal lead and then added to it with three scores separated by just 2:19 for a 10-6 lead through 45 minutes. The Saints scored a man-up goal at 4:59 and then picked up a man-down goal at 3:20. 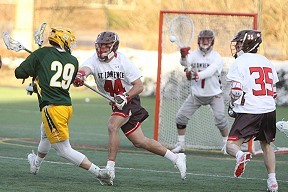 The lead increased to five for St. Lawrence with an early goal by David Jennings, but the Knights chipped away late in the fourth quarter to put plenty of pressure on the Saints. Pierce Currie scored a man-up goal at 7:43, Billy Bergan picked up a goal at 6:09, and Evan Burgett scored another man-up goal at the 4:28 mark to pull the Knights within two. With just one minute remaining, freshman Bryan Penney converted to make the score 11-10. Clarkson won the next faceoff, but the Knights could get only one shot off, a save by St. Lawrence's Alex Terry on Marcus Lavarnway's attempt with 13 seconds to go. St. Lawrence did turn the ball over shortly after gaining possession, but the Knights were unable to make one final run at a tie. St. Lawrence held a 37-27 edge in shots, but the Knights led 19-17 in shots on goal. The Saints also held a modest advantage in groundballs (26-22). Billy Bergan scored three times to lead the Clarkson offense, while Conor Bartlett and Pierce Currie each scored twice and Evan Burgett added a goal and an assist. Liam St. Croix scooped up five groundballs and Kevin Dyckman made six saves for the Knights. For St. Lawrence, Mike Donnelly scored four times and Jack Hennessey contributed three points on a goal and two assists. Zachary Prime won 15-of-23 faceoffs and picked up 12 groundballs. Owen Manley caused three turnovers and also chipped in two groundballs. Alex Terry made nine saves for the Saints. 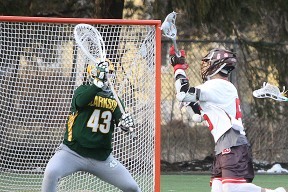 April 6: With 10 goals in the first half, the Clarkson University Men's Lacrosse team cruised to a 14-4 Liberty League victory over Bard College on Saturday afternoon. The Golden Knights improved to 7-4 overall and 2-2 in the Liberty League, while the Raptors dropped to 3-6 and 0-4. Clarkson faces St. Lawrence University on Wednesday in Canton, NY, and the Knights will take on Vassar College at home next Saturday. Clarkson was dominant in the first half, holding the Raptors to just four shots overall and only one shot on goal in the first 30 minutes while peppering the Bard defense with 30 total shots. The Raptors hung around in the first quarter, holding Clarkson to just two goals, both from senior Peter Herrick. However, Clarkson was busy in the second period, tallying eight times. Pierce Currie scored twice and Evan Burgett picked up two goals in the quarter. With a sizeable advantage, Clarkson pulled the starters in the second half, allowing for a more interesting contest. Clarkson held a modest advantage in shots (22-19) over the final 30 minutes and trailed in groundballs (18-15) while being tied in shots on goal (11-11). Currie scored four points to lead the Knights while Conor Bartlett and Will Britton each recorded three points. Herrick and Burgett tallied two goals apiece and Tanner Cioffi and KJ Sarni each notched two points with a goal and an assist. Trevor Borchardt and Derek Beatty each scooped up four groundballs. Kevin Dyckman was called upon for just one save in the first half, while Alexandre Michaud and Matt Yonko combined for seven saves in the second half. 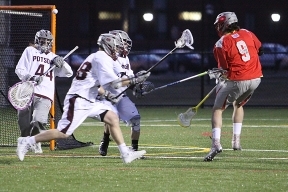 For Bard, Peter Sojka tallied three goals and Jack Kaplan added two assists and four groundballs. Corey Rich also scored once and notched five groundballs. Lyle Healey was busy in the Bard crease, making 20 saves. 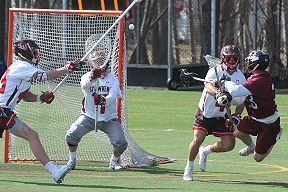 April 13: The SUNY Potsdam men's lacrosse team (4-6, 1-2 SUNYAC) defeated the SUNY Brockport Golden Eagles (4-6, 0-3 SUNYAC) 5-4 on Saturday to pick up a critical SUNYAC win. After being tied early in the fourth quarter, the Bears got a goal from freshman attacker Keenan O'Gorman (Potsdam, N.Y./Potsdam) with 11:22 left to secure the victory. Senior captain Zach Sheridan (Clay, N.Y./Cicero-North Syracuse) stopped a career-high 22 shots, topping his previous best of 20 set Wednesday night. 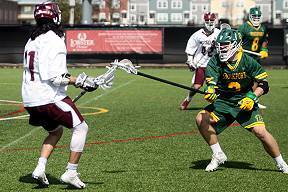 Brockport got on board first at 11:46 of the first quarter as senior attackman Jacob Recor (Lancaster, N.Y./Lancaster) scored a man-up goal off an assist from sophomore attacker Peter Scavone (East Islip, N.Y./St. John The Baptist). Junior midfielder Corey Choberka (Vestal, N.Y./Vestal) gave the Golden Eagles a 2-0 lead as he fired a bullet into the net at 8:16. The Bears answered with two goals in two minutes to tie the game. Potsdam got on the scoreboard with a goal from freshman midfielder Alec Miller (Williamsville, N.Y./Williamsville South) at 6:50. At the 4:50 mark, junior midfielder Josh Huiatt (Libson, N.Y./Hugh C. Williams) unloaded from the left wing to beat Brockport freshman goalie John Felice (Port Jefferson Station, N.Y./Comsewogue). Sophomore attackman Liam O'Connor (Ossinging, N.Y./Ossinging) gave Golden Eagles their lead back before the conclusion of the quarter by sending a shot to the left corner of the goal with 4:03 to go. The Golden Eagles led 3-2 after one. Bears junior attackman Tayte Murray (Cicero, N.Y./Cicero-North Syracuse) tied the game at 6:25 of the second quarter after getting past his defender and scoring in close. After a low scoring quarter, the Bears took the lead going into halftime as they got a man-up goal from senior midfielder Kyle Smith (Theresa, N.Y./Indian River) with two minutes left. Felice committed the infraction and was replaced by senior goalie John Clancy (Mineola, N.Y./Miniola) until he allowed the goal. The Golden Eagles were unable to respond before the conclusion of the quarter as the Bears led 4-3 through 30 minutes. The Golden Eagles tied the game with the third quarter's lone goal with 4:06 left. After a series of passes, sophomore attacker Patrick Sheridan (Rochester, N.Y./ Churchville-Chilli) found the net a few feet away from the goal. Sheridan made six saves in the final quarter to keep the game tied. O' Gorman finally put Potsdam up for good at 11:22 after scooping a low pass from Murray and scoring on a high shot. With strong ball control and Sheridan sharp, the Bears held the lead and the ball with 21 seconds go. However, the Golden Eagles forced a turnover and Patrick Sheridan had a chance to tie the game with about 10 seconds left. It wasn't meant to be, as Zach Sheridan deftly snatched the ball out of the air and fired it down field to seal the win. Felice was the tough luck loser after allowing just 4 goals and making six saves in 59:29. Clancy allowed the one man-up goal in 31 seconds in net. April 10: SUNY Potsdam senior captain Zach Sheridan (Clay, N.Y./Cicero-North Syracuse) made a career-high 20 saves and picked up his first collegiate assist, but the SUNY Potsdam men's lacrosse team (3-6, 0-2 SUNYAC) fell to Oswego State (7-2, 2-0) 11-9 on Wednesday evening. Junior captain Josh Huiatt (Lisbon, N.Y./Hugh C. Williams) led the Bears with three goals and an assist and seniors Josh Bradford (Whitney Point, N.Y./Limestone College) and Sean Coe (Baldwinsville, N.Y./C. W. Baker) each scored twice. Potsdam got on the board first as junior attackman Tayte Murray (Cicero, N.Y./Cicero-North Syracuse) set up senior attackman Kyle Smith (Theresa, N.Y./Indian River) at 12:50. The Lakers scored four of the next five to grab a 4-2 lead after one. Junior attackman Kyle Bacon (Montgomery, N.Y./Pine Push), junior midfielder Tim Schof (Montgomery, N.Y./Pine Bush) and junior attackman Evan Hollfelder (Hamburg, N.Y./Hamburg) scored in succession, but Coe brought the run to an end with a highlight reel goal at 4:07. Smith fed Coe at the left side of the net and he fired the ball behind his back and past Lakers sophomore goalie Kevin O'Donnell (Cleveland, Ohio/Saint Edward). With 10 seconds left in the first, sophomore midfielder Brian Rowe (Cicero, N.Y./Cicero-North Syracuse) struck for the Lakers to make it a two-goal contest. Schof made it 5-2 40 seconds into the second quarter, but the Bears answered with the next two. Huiatt scored at 13:20 and then set up a man-up goal for senior captain Gabe Carbone (Accord, N.Y./Rondout Valley) at 11:59 to get Potsdam back within 5-4. Oswego closed the half on a 3-1 run. Freshman attackman Weston Gray (Philadelphia, N.Y./Carthage) scored at 11:10 but Murray fed Huiatt for another man-up goal at 9:26. Junior attackman Caleb Alford (Adams, N.Y./South Jefferson) scored at 8:53 and Hollfelder netted his second at 7:42 and the Lakers led 8-5 at the half. Potsdam outshot Oswego 17-7 in the third quarter, but the Bears were unable to pick up ground as the teams traded a goal each. Schof completed his hat trick at 12:35 and Bradford countered at 9:19 to make it 9-6. Junior faceoff specialist Luke Vitale (Fairfield, Conn./Fairfield Ludlow) won the ensuing faceoff and the Bears controlled the ball for the next three minutes. In that time they took eight shots, but O'Donnell kept them off the board with three crucial saves. Potsdam opened the fourth with two goals in 2:46 to climb within 9-8 with 11:02 to play. However, Lakers sophomore midfielder Bobby Emerson (Lake Grove, N.Y./Center Reach) scored two in-a-row at 7:06 and 6:20 to put the game out of reach. The Bears closed the game with a final highlight. In the closing seconds, Sheridan flung the ball down the field from just outside his crease. Coe caught in front of O'Donnell, stepped around the goalie to with one second left. O'Donnell earned the win with 13 saves. Potsdam outshot the Lakers 45-43 and was 2-for-2 in extra-man opportunities, while Oswego was 1-for-3. Senior captain Colby Chapman (Johnson City, N.Y./Johnson City) collected five ground balls for the Bears and Vitale won nine faceoffs. April 26: Senior Ryan Cardiff (Albany, NY) scored six goals and senior Corey Spuck (Rochester, NY) stopped 12 shots as the men's lacrosse class of 2015 went out in style with an 18-6 victory against visiting Houghton College on Tuesday. The Roos honored their five seniors Tony Carden (Franklin, MA), Richard Brogden (Rockville, MD), Steve Novak (Seymour, CT), Cardiff and Spuck in a halftime ceremony. Twelve different players tallied a point and nine different players scored for the Roos (3-9) in the contest. Cardiff led the way with six goals and a game-high 11 ground balls. Chris Gamble (Carthage, NY) added a hat trick, while Mike Statt (Rochester, NY) posted two goals and an assist and Brandon Rodee (Canton, NY) caged two goals. SUNY Canton posted the first four goals to lead 4-0 after just 4:41 of play. Houghton got on the board with 9:19 to play in the opening quarter but Cardiff's second and third tallies of the game gave the hosts a 7-1 lead after 15 minutes of play. The Roos scored the only two goals of the second quarter to lead 9-1 at intermission. 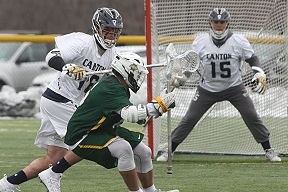 SUNY Canton scored three goals in the third stanza from the sticks of Jared Jock (Hogansburg, NY), Cardiff and a man-down goal from Statt. Rodee scored twice in the fourth quarter including his first collegiate goal. Jamie Stevens (Hudson, NY) rounded out the scoring for SUNY Canton with his first career goal with 2:20 to play en route to the 18-6 victory. All 27 Roos on the roster appeared in the contest. Novak posted seven ground balls, while Brogden and Carden combined to force five turnovers. Spuck stopped 12 shots over the first 51:06 allowing just five goals and picking up five ground balls. Josh Haingray made 17 stops for Houghton, while Jordan Warren clocked the final 2:20 of the contest. April 1: Cam Carter (Colonie, NY) and Chris Gamble (Carthage, NY) each found the back of the net three times but visiting SUNY Potsdam earned an 18-9 victory on Wednesday evening in Canton. The visitors scored the first two goals of the game but SUNY Canton got on the board on Gamble's 11th of the season 2:12 into the game. Carter got the Roos (0-7) within 5-2 on his third of the season midway through the first quarter. The Bears (5-3) closed the opening period strong scoring the final four goals of the stanza. Carter would add his second of the game and Ryan Cardiff (Albany, NY) caged his 11th of the season as Potsdam led 12-4 at intermission. Carter and Gamble slotted back-to-back scores 2:43 apart to get the Roos within 13-6 but that was as close as they would get en route to the 18-9 final. Garrett DiTullio (Potsdam, NY) and Devin Gruneisen (Potsdam, NY) netted fourth quarter goals for the hosts, while Gruneisen also picked up a team-best six ground balls. Corey Spuck (Rochester, NY) stopped 13 shots for the Roos, while Jack Bezek turned aside three shots in 30 minutes of play to earn the win. Jackson Corcoran and Alex Uhlein came on in relief for the Bears. The men's lacrosse team is back in action next Tuesday when it travels to take on Wells College at 4:00 p.m.
May 2: Down 12-5 entering the final 15 minutes of play, the Plattsbugh State men's lacrosse team were the architects of a furious comeback attempt, outscoring the number-one seeded and No. 11-ranked SUNY Cortland 7-2 in the fourth quarter only to come up short in a 14-12 setback to the Red Dragons in the 2015 SUNYAC Men's Lacrosse Championship Tournament finals on Saturday afternoon. In the Cardinals' 2015 season finale, senior Jack Felter amassed four points on three goals and one assist and freshman Ryan Hubbard pumped in two scores in the last 6:56 of the game. They were two of the seven Plattsburgh State student-athletes to record multi-point games. Saturday marked Plattsburgh State's third-consecutive appearance in the SUNYAC Tournament finals – all of which have come against the Red Dragons. The Cardinals wrap up their 2015 campaign with a record of 13-6 which includes a 4-2 showing in conference tilts. Although the visitors never led, they made sure to keep consistent pressure on the Red Dragons for the majority of the skirmish. Felter registered his first of the day in the opening quarter. Assisting on the Cardinals' first strike of the day was senior James Read who notched his first of three points on the day with the helper. Trailing 2-1 headed to the second frame, the Cardinals saw the SUNY Cortland tandem of Matt Savlov and Mike Cantelli fire in their second goals of the afternoon in the first 3:30 of the quarter, upping the Red Dragons' edge to 4-1. Refusing to go down quietly, the Cardinals pulled within one once again after Matt Renko and Austin Belz slung in scores. From there, the teams alternated scoring with Brendan Damm and Felter accounting for Plattsburgh State's goals. Felter's man-up laser cut the Red Dragons' advantage to 6-5 heading to halftime. Unfortunately for the Cardinals, the Red Dragons came roaring out of the mid-game break with intentions of putting the game out of reach for good. Benjamin Dunlavey completed his hat trick with a pair of scoring drives and T.J. deLyra slung in two of his own as part of a 6-0 scoring run for the home team which spanned the entire quarter. On the wrong end of a 12-5 deficit heading to the final frame, the Cardinals unleashed a desperate all-out assault on the Red Dragons in a bid to emerge as the victors. Mike Gay opened the Plattsburgh State scoring barrage with his seventh of the season, but goals from Zach Hopps and Billy Davis helped the Red Dragons maintain their eight-goal lead, 14-6, with 10:18 to go. The Cardinals' never-say-die attitude manifested itself in a big way through the final 8:54 of the battle. Belz initiated a 6-0 Plattsburgh State offensive blitz with his second of the day before Damm and Felter added scores 28 seconds apart to make it a 14-9 game with 7:06 to go. Back-to-back tallies from Hubbard and Read's sole missile of the day with 1:53 to go pulled the visitors within 14-12, but a costly turnover with 1:13 to go allowed the Red Dragons to run out the clock and capture their 23rd conference crown. Junior netminder and All-SUNYAC Tournament Team selection Matt Massaria did all he could to keep his squad in it, making 16 stops in 60 minutes of action. 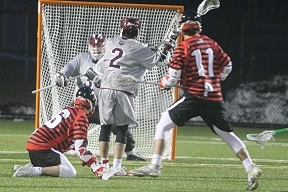 Cortland goalie Scott Tota faced 46 total shots and made 10 saves in the win. Although they didn't come up on the winning end of things, the Cardinals have very little to hang their heads about. Head coach Ryan Cavanagh took over as the program's all-time leader in coaching victories during the 2015 campaign and Massaria, Renko and senior Brendan Cefalu received spots on the All-SUNYAC Tournament Team as a result of their excellent play. In all, some 11 seniors which include the likes of Cefalu, Felter, Read, Chris Guzzetta, Cole Andersen, Andrew Tralongo, Andy Krolczyk, Tom Monahan, Peter Johann, Brendan Hickey and Frank Mauro, wrapped up their careers on Saturday afternoon. That group has led Plattsburgh State to four straight SUNYAC Tournament appearances and a record of 51-22 in its tenure. April 1: Plattsburgh State junior attackman Brendan Damm scored four goals and assisted on a fifth, leading the Cardinals to a 11-7 NCAA Division III lacrosse victory over St. Lawrence University in a game played at Canton College on Wednesday. The Cardinals, now 8-4 on the season, snapped a two-game win streak for the Saints who were coming off an upset win over third-ranked Union College on Saturday. SLU fell to 5-5 on the season heading into a Liberty League road game at Vassar on Saturday. The Saints stayed close as sophomore Conor Healey, who was named the USILA Division III North Offensive Player of the Week for his performance in wins over Geneseo and Union had a goal and set up four others, but the Cardinals took a 7-6 lead with 2:30 left in the third period which started a run of five unanswered goals and a 11-6 Plattsburgh lead with 4:20 to go in the game. Connor Brimley scored with eight seconds left for the 11-7 final. The two teams were tied at 2-2 after one and Plattsburgh had a 6-5 lead at the half on Jack Felter's 24th goal of the year with 20 seconds to go in the second period. Jon Fairbanks tied it for the Saints at 7:30 of the third with his fourth off Healey's assist, but Damm and James Read had two goals each and Read added an assist in the 5-0 Plattsburgh run which put the game away. Saint goalie Andrew Butturini had 13 saves while Plattsburg's Matt Massaria made 12 stops. Plattsburg was one for five in man up opportunities while the Saints were scoreless in two tries and the Cardinals finished with a 34-29 edge in shots and a 25-15 margin in ground balls. Plattsburgh's Joey Kromer helped his team to 15 faceoff wins in 22 opportunities. In addition to Healey's five point outing, Jeremy Vautour had two goals, Luike DiLioso had a goal and an assist and Charlie Duprey had a goal to join Fairbanks and Brimley in the scoring column. SUNY Geneseo at St. Lawrence University, ppd. 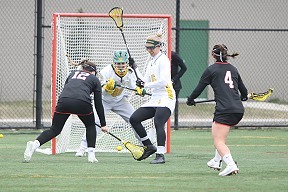 April 10: With 10 goals in the first 12 minutes, the Clarkson University Women's Lacrosse team was up early on first-year program Plattsburgh State and the clock ran from there as the Golden Knights gained a 24-2 victory over the Cardinals on Wednesday afternoon. The Golden Knights improved to 6-6 on the season and will take on RIT this weekend, again at Hantz Turf Field. Plattsburgh dropped to 1-11 on the campaign. Clarkson picked up a goal in the first 42 seconds, then tallied again just 26 seconds later and the rout was on. The Golden Knights produced 15 goals in the first half, holding Plattsburgh to just five shots and scoring on more than 60% of their chances overall. In the second half, Plattsburgh got a brief lift from freshman Emily Caoili when she scored two goals in a span of just 73 seconds. However, Clarkson got things rolling again with a pair of man-up goals and closed out the game on a 6-0 run with its reserves. Clarkson finished the game with a 44-8 edge in shots and a 36-7 lead in shots on goal. Junior Emma Andrews scored a team-best six points, scoring three times and finding her teammates for three assists. Jaid Baytos kicked in five points (including four goals) and added in two groundballs, two caused turnovers and two draw controls. Aubrey Borgesi also chipped in four goals with four draws and three groundballs. Sydney Roderick (0-3-3), Katie Sergeant (3-0-3), Mia Petrone (3-0-3) and Abby Collins (1-2-3) each added three points for the Knights. April 6: A day after scoring just one goal in a loss to nationally-ranked William Smith, the Clarkson University Women's Lacrosse team put up 16 goals against another nationally-ranked foe in Ithaca College, but the result was still the same as the Golden Knights fell 24-16 in Liberty League action on Saturday afternoon. The Golden Knights dropped below .500 in both the league and overall, falling to 2-3 in conference games and 5-6 overall. Ithaca stayed unbeaten in the Liberty League at 5-0 and moved to 8-3 on the season. Clarkson finishes off non-league play on Wednesday when it hosts Plattsburgh State at Hantz Turf Field. The 16 goals scored by the Knights were tied for the most in program history in a loss (17-16 loss to RIT, 2013) and the 40 combined goals in the game easily topped the previous record at Clarkson when 35 combined goals were produced in a 20-15 victory by the Knights over Oswego State in 2010. The 24 goals allowed by Clarkson were the third-most in program history, trailing 25 given up to Rensselaer (1994) and 26 against Cortland State (1986). When Abby Collins scored at the 17:02 mark, the Knights and Bombers had already combined for more goals than Clarkson and William Smith totaled on Friday, and try as they may, the Green and Gold could not keep pace with Ithaca's high-octane offense. When Mia Petrone scored at the 13:43 mark, the Knights were within one, but Ithaca scored six of the last seven goals in the half, including a four-goal run in the final five minutes, for a 13-7 lead. The Bombers scored twice in the first minute of the second half, but the Knights rattled off three straight goals to make it 15-10 at the 22-minute mark. 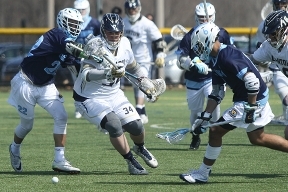 Ithaca responded with a pair of three-goal runs at the other end, sandwiched around a two-goal spurt by Clarkson, to threaten a running clock. However, the Knights tallied three times in a stretch of just 48 seconds to close the gap to just six (21-15). With the way the teams were rolling up offense, it seemed no lead was safe, but the Bombers pushed three more goals into their column to close out the game. Sydney Roderick scored a season-high eight points on four goals and four assists for the Knights while classmate Mia Petrone and junior Aubrey Borgesi each scored three goals. Abby Collins added a goal and an assist as well as six draw controls, and Stephanie Scaia was a bright spot on the defensive end with four caused turnovers and three groundballs. Samantha Gladd made 10 saves in the start for the Knights and Carolynn Pechmann denied one shot in relief. Allie Panara earned an incredible 15 draw controls and also scored seven points on three goals and four assists, matching the output of Danika Wagener, who had six goals and an assist. Bailey Herr notched six points on five goals and one assist and Jacqui Hallack produced five points with four goals and one assist. Mackenzie Schade stopped five shots in the Ithaca crease. 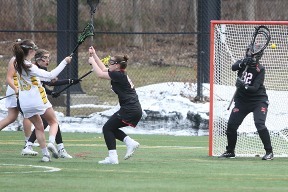 April 10: Freshman goalie Alexa Cassidy (Warwick, N.Y./Warwick) made a career-high 12 saves and freshman attacker Emily Caoili (Lagrangeville, N.Y./Arlington) scored twice, but the Plattsburgh State women's lacrosse team fell, 24-2, to Clarkson University in non-conference action Wednesday afternoon at Hantz Turf Field. Clarkson finished with the upper hand in shots (44-8), ground balls (26-18) and draw controls (16-12) while converting on 5-of-9 free-position shots. On clears, the Cardinals were 6-for-15, while the Golden Knights were 17-for-19. Plattsburgh State falls to 1-11 overall with the loss and next hosts Oswego State on Saturday, April 13, at 1 p.m. Clarkson rises to 6-6 overall with the win and hosts the Rochester Institute of Technology next on Saturday, April 13, at 3 p.m. Caoili scored both of the Cardinals' goals, while Cassidy scooped up a team-high five ground balls. Sophomore attacker/midfielder Kerri Corcoran (Rockville, Md./Richard Montgomery) led Plattsburgh State on the draw with five draw controls. For Clarkson, junior attacker/midfielder Emma Andrews led the way with six points on three goals and three assists, while senior attacker/midfielder Jaid Baytos tallied five points on four goals and an assist. Junior attacker Aubrey Borgesi scored four times, while freshman attacker Sydney Roderick (three assists), junior Katie Sergeant (three goals), freshman midfielder Mia Petrone (three goals) and junior midfielder Abby Collins (one goal, two assists) all notched three points. Borgesi finished with four draw controls and three ground balls, while Baytos, Roderick and freshman midfielder Abigail Johnson all caused two turnovers. The Golden Knights used four goalies in the win, with the quartet combining for five saves. April 6: Junior attacker Katelyn McGlauflin (Scotia, N.Y./Scotia-Glenville) scored for the Plattsburgh State women's lacrosse team in the Cardinals' 23-1 loss to The College at Brockport Saturday afternoon at Bob Boozer Field in State University of New York Athletic Conference (SUNYAC) action. The Golden Eagles finished with the upper hand in shots (38-6), ground balls (22-9) and draw controls (18-7) in addition to going 3-for-5 on free-position shots. On clears, the Cardinals were 4-for-14, while the Golden Eagles were 10-for-10. Plattsburgh State falls to 1-10 overall (0-5 SUNYAC) with the loss and next visits non-conference Clarkson University on Wednesday, April 10, at 4 p.m. Brockport rises to 9-1 overall (4-0 SUNYAC) with the win and visits Fredonia next on Wednesday, April 10, at 4 p.m. Sophomore attacker/midfielder Kerri Corcoran (Rockville, Md./Richard Montgomery) controlled three draws, caused a turnover and scooped up a ground ball, while freshman goalie Alexa Cassidy (Warwick, N.Y./Warwick) collected two ground balls. Offensively, the Golden Eagles were led by senior attacker Sara Grapevine and freshman attacker Allison Jennings, who had eight points (three goals, five assists) and seven points (five goals, two assists), respectively. Junior attacker Chloe Kurst registered six points on two goals and four assists, while senior midfielder Hannah Cullen (two goals, two assists) and graduate student attacker Heather Conklin (four goals) each finished with four points. Freshman midfielder Julie Carballo scooped up five ground balls and controlled two draws, while senior defender Nikki Nolan and sophomore defender Lyndsie Pratt each recorded five draw controls. Cassidy made nine saves in the loss for Plattsburgh State, while freshman goalie Morgan Elmer turned aside four shots in the win for Brockport. April 25: The SUNY Potsdam women's lacrosse team (5-11, 2-6 SUNYAC) battled 17th-ranked Fredonia State (14-2, 7-1) for 60 minutes, before bowing to the Blue Devils 9-6 on Saturday afternoon. In her final game, senior captain Margaret Wall (Rochester, N.Y./Aquinas) scored two goals for the Bears and junior attack Bri McClusky (Watertown, N.Y./Immaculate Heart) added four assists to set the Potsdam single-season assists record with 34. Katie Kleine led the Blue Devils with three goals and two assists. Kleine set up Katie Glagolev to open the scoring 2:55 into the game. Wall answered at 26:32 on a helper from McClusky to start a 3-0 run. The duo repeated the scoring at 14:19 and McClusky set up senior attack Bailey Weigel at 12:31 to give the Bears a 3-1 lead. Fredonia closed the half with three straight goals and took a 4-3 lead into the break. Shelby DePew scored two in a row and Audrey Yokopovich got the final goal of the half at 3:27. All three markers came on assists from Marissa Cussins. Kristie Kleine put the Blue Devils up 5-3 at 27:42 of the final period, but senior captain Emily Petit (Queensbury, N.Y./Queensbury) countered to get Potsdam back within one 44 seconds later. Fredonia scored four straight in a 2:40 span to build a 9-4 lead with 16:39 to play. Katie Kleine scored all three of her goals during the stretch. 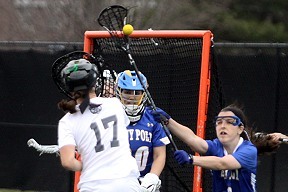 With 41 seconds left, McClusky connected with sophomore attack Michaela Cole (Parishville, N.Y./Parishville-Hopkinton). 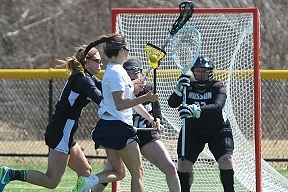 Sophomore attack Katie Lapinski (Canton, N.Y./Hugh C. Williams) closed the scoring 21 seconds later for the 9-6 final. In goal, Potsdam sophomore Devan Olschewske (Canandaigua, N.Y./Canandaigua) made 11 saves. Nicole Burrows earned the win with four saves for Fredonia. The loss brings to a close the careers of seniors Wall, Weigel, Petit, Katie Putnam (Chittenango, N.Y./Chittenango) and Cheyenne Lazore (Akwesasne, N.Y./Salmon River). Wall finishes her career ranked seventh in scoring with 106 points and fourth in goals with 90. Weigel is fourth in scoring with 143 points, fifth in goals (89), third in assists (54) and first in draw controls (324). Petit totaled 33 goals and 15 assists for 48 points. She finishes her career as the program's all-time leader in ground balls (170), caused turnovers (86) and games-started (57) and is sixth in draw controls (81). Putnam recorded 11 points on 10 goals and an assist along with 69 ground balls, 28 caused turnovers and 11 draw controls. Heading into next season, McClusky is already fifth on the Bears all-time scoring list with 130 points. She is ninth in goals (67) and second in assists (63). 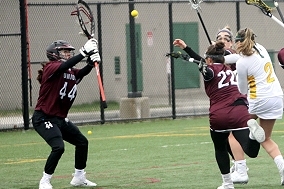 April 9: Senior attack Bailey Weigel (East Amherst, N.Y./Williamsville East) scored the game-winning goal with 27 seconds left as the SUNY Potsdam women's lacrosse team (4-7) completed its 10-9 comeback victory over SUNY Canton (7-3) on Thursday afternoon. Weigel finished with three goals and an assist and junior attack Bri McClusky (Watertown, N.Y./Immaculate Heart) contributed a goal and three assists. Senior captain Margaret Wall (Rochester, N.Y./Aquinas) scored twice for the 100th and 101st points of her career. 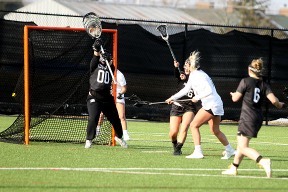 Sophomore goalie Devan Olschewske (Canandaigua, N.Y./Canandaigua) made 11 saves, including nine in the second half to help the Bears to their third straight win. The teams cautiously felt each other out over the opening five minutes, but Kangaroos sophomore midfielder Hannah Christiansen (Lake View, N.Y./Frontier) broke the stalemate with a goal at 24:32. McClusky set up sophomore attack Michaela Cole (Parishville, N.Y./Parishville-Hopkinton) 24 seconds later to tie the score. At 21:42, McClusky gave Potsdam its first lead at 2-1 with an assist from sophomore midfielder Murphy Newman (Canton, N.Y./Berkshire School). Christiansen answered with two straight, the first on free position at 20:11, and the Roos were back up 3-2 at 18:27. McClusky set up Weigel nearly four minutes later to tie the game at three all. Canton junior midfielder Robyn Carroll (Bowmanville, Ontario/St. Stephens) and Bears sophomore midfielder Alyssa Ferenczy (Williamsville, N.Y./Williamsville South) traded the next two goals, before the Roos closed the half on a 3-1 run. Canton sophomore attack Katelynn Nutter (Carthage, N.Y./Carthage) started the run and Carroll scored the final two. Wall reached the 100-point plateau on a pretty pass from sophomore attack Katie Lapinski (Canton, N.Y./Hugh C. Williams) at 5:50 and Potsdam trailed 7-5 at the break. Chritiansen scored her fourth of the game 1:55 into final half and the Bears were down three goals and on the ropes. Fortunately, Olschewske raised her game when her teammates needed her most. Carroll picked up the ensuing draw control and went straight for the goal. Olschewske shut her down and then did it again a minute later. 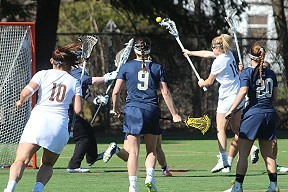 She then picked up the ground ball and started a successful clear that resulted a Newman goal to close the gap to 8-6. Weigel assisted on the play. Four minutes later, Olchewske stymied Canton's leading scorer Tressa Goolden (Canton, N.Y./Hugh C. Williams) and Weigel capitalized with a free-position goal to get the Bears within one. Olschewske stopped Carroll again with just over 18 minutes remaining, and Newman tied the game at 17:24 with a man-down, free-position attempt. The teams went at each other without scoring for the next 12 minutes, largely due to excellent goaltending at both ends of the field. Olschewske racked up four more saves during the stretch including a stop of Carroll on a free position. Canton sophomore goalie Becca Kieffer (Lee Center, N.Y./Rome Free Academy) was nearly as good, recording two saves and a stop of Weigel on a free position. It was Wall who finally broke the draw on a pass from McClusky with 6:28 left, but the Kangaroos weren't done. After another Kieffer save, Carroll connected with Nutter to get the Kangaroos even with 5:35 to play. Olschewske stopped a Goolden free position at 4:29 and Kieffer returned the favor for sophomore defender Hannah Keggins (Watertown, N.Y./Watertown) at 2:58. Kieffer made one final save with a minute to go, but with 27 seconds remaining, Weigel fought her way through crowd and fired the ball into the top of the net for the decisive tally. Keggins scooped up the final draw control and ran out the clock. Kieffer finished with a game-high 12 saves. The Bears topped the Kangaroos in shots (32-23), ground balls (22-14) and draw controls (14-7). Potsdam is back in action when the Bears host Brockport at 12:30 p.m. on Saturday. The Potsdam will honor seniors Wall, Weigel, Emily Petit (Queensbury, N.Y./Queensbury), Katie Putnam (Chittenango, N.Y./Chittenango) and Cheyenne Lazore (Akwesasne, N.Y./Salmon River) for Senior Day prior to the game. April 13: The SUNY Canton women's lacrosse team jumped out to an 11-0 halftime lead and never looked back as they earned a 17-3 win v. Husson University in North Atlantic Conference (NAC) action on Saturday afternoon. The Roos, winners of four straight, improve to 10-2 overall and remain unbeaten in NAC play at 5-0. The Eagles fall to 5-5 and 1-1.Denny led all players with six goals and one assist, while EllaRose LeMay record her first collegiate hat trick. Cecelia Neally tallied a season-high four points on a goal and three assists. Stephanie Thayer finished with two goals and one assist, while Jessica Pele added a pair of scores. MaryClare Bowes posted a goal and assist and Emily Vogt and Lindsey Ingram scored one goal each. Mia Jermano caused a game-high four turnovers, while Pele, LeMay and Denny picked up game-bests of four ground balls. Pele and Neally led the Roos with three draw controls each. Canton jumped out to an 11-0 lead at halftime behind four goals from Denny and three from LeMay. Overall, the Roos scored 17 unanswered goals before Husson finally got on the board when Mary Cushing found the back of the net with 10:14 remaining. The Roos controlled shots on goal (34-5), ground balls (27-14), draw controls (13-8), turnovers (23-37) and went 13-for-17 on clears compared to a 6-for-27 effort for Husson Nicole Piskorowski stopped both shots she faced in the first half to earn the win. Mallory Burchill made 17 saves for the Eagles. April 8: Four players recorded hat tricks as the SUNY Canton women's lacrosse team earned a 17-10 win in non-conference action at Castleton on Monday. The Roos, who have won three straight and six of their last seven, improve to 9-2 on the season, while the Spartans fall to 5-6. Molly Denny led all players with five goals, six points and five ground balls, while adding a pair of draw controls and caused turnovers. Logan Bush provided three goals, two assists and four draw controls. Stephanie Thayer tallied a career-high four goals, while MaryClare Bowes also had a hat trick. Jessica Pele finished with two goals, one assist, a team-high seven draw controls and three ground balls. Mia Jermano totaled a game-high four draw controls, while Shelby Roberts added three. Maddy Weir chipped in with four ground balls defensively. The Roos jumped out to a quick 5-0 lead over the first seven minutes. Castleton finally got on the board with 14:52 left in the opening half. Canton took a 9-4 lead into intermission. The Spartans trimmed the lead to 10-7 early in the second half but the Roos rattled off four of the next five goals to ice the victory. Madison Leary made four saves in the first half to earn the win, while Nicole Piskorowski turned aside four shots in relief in the second half. Samantha Hebb was credited with three saves over the first 16:27 taking the loss. April 25: The St. Lawrence University Women's Lacrosse team ended the 2015 season in impressive fashion with five different players netting two goals each in a 17-4 win over Bard College Saturday afternoon in the season finale at Ferrari Field at Annandale-on-Hudson.Abigail Owens, Hayden Stein and Kayla Schmalz each scored twice in the first half while Julia Mitguy and Allie Cornell-Roberts added a goal in each half as the Saints built an early 10-1 lead and cruised to the 17-4 win.Chloe Knapp scored the first St. Lawrence (4-11 Overall, 2-7 Liberty League) goal 38 seconds into the game but Bard (2-13, 0-9) tied the score two minutes later. The Saints then score the next nine straight goal to build a 10-1 lead. After Stein scored her second goal of the game with 1:20 left in the half, Bard rallied to score the final two goals of the period in the final minute of play and the teams went into the halftime intermission with the Saints leading 11-4.The St. Lawrence defense did not allow a second-half goal and the Saints scored four times in the first 10 minutes of the half to build a double-digit lead. St. Lawrence scored twice down the stretch including one goal by senior goalie Adden Cunningham who had been inserted into the game as an offensive player after starting the game in the Saints goal.Ashley Norris and Ashley Noble added second half goals while Kiera Taussig and Jill Carlton each scored once in the first half of play.Cunningham started in goal and played the first 14:28 with no saves before Cricket Wemyss was inserted to play the final 45:32 of the game making four saves. April 10: Junior Chloe Knapp scored three goals including two in the second half as the St. Lawrence University Women's Lacrosse team came back from a six-goal deficit to tie the score and force overtime before Skidmore scored the game-winner in the second overtime period for a 14-13 Liberty League victory Friday afternoon on Weeks Field at Leckonby Stadium in Canton. Skidmore (8-3 Overall, 3-1 Liberty League) scored six consecutive goals after St. Lawrence (2-8, 0-4) had jumped out to an early lead with a goal by sophomore Tori Smith 4:36 into the contest. Knapp stopped the Skidmore scoring streak with the first of her three goals on the day with 9:50 left in the first half. The Thoroughbreds added two more goals before the end of the period to take an 8-2 lead into the halftime intermission. Junior Jill Carleton scored the first of five consecutive Saints goals 57 seconds into the second half. Knapp added her second of the game and junior Michaela Maybee scored the first of two goals followed by a pair of Kara Hurley goals as St. Lawrence trimmed the lead to 8-7. The teams traded goals over the next six minutes with Knapp and Abigail Owens scoring for the Saints before St. Lawrence pushed ahead with three straight goals. Maybee, Julia Mitiguy and Ashley Norris each scored to give the Saints a 12-11 lead with 3:30 left in the second half. Less than a minute later, Skidmore tied the score at 12-12 and had a chance to take a lead late in the game but Nicole Adee caused a turnover and the teams ended regulation play tied. Near the midpoint of the first overtime period, Owens scored to give the Saints the 13-12 lead with 16 seconds left before the teams traded ends for the second half of the first overtime session. Skidmore controlled the draw and rushed up the field scoring 11 seconds later and the teams were tied a 13-13 before changing ends. Skidmore's leading scorer Tyler Phillips had two shots including one on a free position attempt but Saints goalie Adden Cunningham made a huge save to keep the score tied. St. Lawrence had a pair of shots late in the first overtime session with both going wide of the goal and the teams moved to the second overtime period with a three-minute sudden victory overtime period. Maybee had a good shot early in the second overtime that was saved. After a pair of turnovers, Skidmore's Spencer Morgan, who finished with five goals, netted a free position shot to end the game. Morgan and Phillips had five goals each for Skidmore. Knapp led St. Lawrence with three goals while Hurley, Maybee and Owens had two goals each. Mitiguy had a goal and an assist and also led the Saints with five draw controls. Cunningham ended up with 12 saves for her sixth game with double-digit saves this season. Copyright © 2001-2019 CommunitySights.com. All rights reserved. All logos, photographs, text, designs and online broadcasts are copyright. No portion of this web site may be copied, transferred, duplicated or otherwise used in any form without expressed written permission.